Many of the researchers at the CTTS lecture on undergraduate and postgraduate programmes relating to translation and textual studies, notably our M.A. in Translation Studies and our M.Sc. in Translation Technology. For information on studying translation at Master’s level click here. For a comprehensive list of post-graduate courses related to the CTTS, click here and scroll down the page. For information on Dublin City University’s post-graduate research and application procedures, click here. Dave has an MA in Translation Studies from DCU. His research investigates lexical diversity in Spanish and English and information transfer when translating between these two languages. The study draws upon theories from Psycholinguistics, while Corpus Linguistics provides its methodological underpinnings and employs modern translation software tools such as ParaConc, Sketch Engine and Wordsmith. Elena graduated in Humanities at the Complutense University, Madrid. She holds a Masters in Islamic Art (University of Edinburgh) as well as a Masters in Teaching Spanish as a Foreign Language (University Antonio Nebrija, Madrid). She has wide range of experience teaching Spanish Language and Culture in different Institutions across Europe, including: DCU University ,where she currently teaches, College of Europe in Belgium, Instituto Cervantes (Athens and Brussels) and the Institute for Applied Language Studies (University of Edinburgh) where she was appointed Assistant Course Director of the Spanish Section. During her professional career, she has participated in different teacher training programs and research projects. Since October 2015, Elena is a PhD student at the School of Applied Language Studies in Dublin City University. She has implemented a design-based classroom research at DCU which examines new multimodal pedagogies in the Spanish as a second language classroom. Drawing on multimodal pedagogies, her approach explores a pedagogy based on active literacy practices in the classroom with the aim of allowing students to become active meaning-makers. In particular, her research evaluates how the use of artworks and Visual Thinking Strategies can support language teaching and learning. Her research title is Developing Communication Skills in Spanish as an L2 context through the use of artworks. Her research interests are Second Language Development, Multiliteracies, Multimodal Classroom Practices, Literacy and language teaching, action-based teaching, Art-based Pedagogy, Visual Thinking Strategies. Shane graduated with a B(ED) in Modern Languages (French and Japanese) from the University of Limerick. His undergraduate research focused on the changing image of the tanuki in Japanese society. During his undergraduate training, Shane spent six months at Aix-Marseille University and a further six months interning as an English teacher in Tokyo. Upon graduation, he spent three years as a Coordinator for International Relations (CIR) on the Japan Exchange and Teaching (JET) programme in rural Japan, working for the Gifu Prefectural Government’s International Affairs Division. He subsequently worked as an in-house interpreter at a pharmaceutical firm in Limerick City. Shane’s PhD research is concerned with translation ethics, aiming to identify whether there is a discrepancy between how words used to identify certain minority communities are parsed in translation and the words that members of those minority communities use to define themselves. He is working with the Japanese to English language pair. His other research interests include language and translation pedagogy, and folklore. He is a qualified second level teacher of both French and Japanese and is assisting with instruction of Japanese language modules in DCU. Shane is funded by the School of Applied Language and Intercultural Studies (DCU). Jack holds a BA International in French and Irish from NUI Galway as well as an MA in Translation Studies from DCU. The thesis for his MA was a comparative analysis of the Irish-language novel Cré na Cille and its English translations; The Dirty Dust and Graveyard Clay. Jack previously spent a year teaching English at L’Université de Bretagne-Sud Lorient in France. For his doctorate research, Jack is examining the crime fiction of French author Didier Daeninckx and how he uses the genre to discuss taboo issues relating to French national identity. Jack is funded by the School of Applied Language and Intercultural Studies at Dublin City University. Ke holds a BA in English and ME in software engineering. Ke’s research involves ethnographic and Human-Computer Interaction-based studies of real users of MT (machine translation) output in an investigation of the cognitive and socio-technical issues affecting MT acceptance and adoption. She specifically conducts research on reception studies of machine translated subtitles (both raw output and post-edited output) in a MOOC environment (EN-ZH). The objective of her research is to improve understanding of cognitive, ergonomic and usability issues associated with MT usage across end-user communities and professional and volunteer translators, for both structured and user-generated content. Ian has a BA in English Literature and an MA in Applied Linguistics, both from University College Cork. At present, his main area of research is the Japanese language, having lived and worked in Japan for over five years. Ian also taught Japanese at UCC until 2016. During that time he developed a specific interest in the teaching of Japanese kanji characters. He is currently doing a PhD on Japanese pedagogy, aiming to synthesize current methodologies into new types of teaching methods which could assist learners in their studies of Japanese kanji. Ian is funded by the School of Applied Language and Intercultural Studies at Dublin City University. Tatiana Krol holds a BA and MA of Education (Gorlovka State Teacher Training Institute of Foreign Languages, Ukraine), and a first class honours MA in Comparative Literature (DCU). For her doctorate research she is examining the mechanisms of the development of varying perceptions between nations during Ireland’s an Gorta Mór and Ukraine’s Holodomor, and ways in which negative stereotyping is reinforced by oppression. Tatiana’s research involves work with translated texts; for example, she is analyzing the novel Maria: A Chronicle of a Life by Ukrainian author Ulas Samchuk, translated by Roma Franko (Canada). Also, for her research purposes, Tatiana Krol translates from various sources, published in the Ukrainian, Polish and Russian languages. Tatiana is funded by the School of Applied Language and Intercultural Studies at Dublin City University. Réidín holds a BCL (Law with French Law) from UCD and a Diplôme d’études juridiques françaises from Université Paris Nanterre. She has completed Master’s degrees at both Trinity College Dublin (LLM) and DCU (MA in Translation Studies). She is currently conducting research on the impact of interpreting on Child Care proceedings in Ireland’s Family Courts. Nansy holds a BA in English literature from Yarmouk University, Jordan and an MA in Translation Studies from DCU. She is a third year Ph.D. student in SALIS, DCU. She is currently a full time lecturer at the Department of Translation, Yarmouk University, Irbid, Jordan. Her Ph.D. dissertation is about collaborative translation in the classroom. The study draws upon the social constructive theory that focuses on teamwork and interpersonal skills in the classroom. This study aims to investigate the feasibility of transferring the classroom into an interactive environment that is similar to a real translation workplace. A collaborative translation classroom is going to be observed at the Department of Translation (Yarmouk University) in order to evaluate this new method of teaching in the field of translation studies. The languages that are going to be used in this classroom are Arabic and English. In light of the 2016 announcement that Chinese will be an examined subject on the Leaving Certificate curriculum within the next ten years, coupled with the fact that Chinese is deemed to be one of the most difficult languages to learn, Caitríona is currently researching the effect various teaching methods have on beginners when learning Chinese. Her thesis title is: What are the methods proven to be most effective for teaching Chinese (Mandarin) as a foreign language to beginner learners? Caitríona has tested four teaching methods among four groups of secondary school students over one academic year. These include rote memorisation, delayed character introduction, character colour-coding and the unity curriculum approach which is currently being used in the Irish third-level institutions offering Chinese as an examined subject. In order to decipher which method is best suited for beginner learners of Chinese, participants conducted a series of evaluations testing the ability to recognise, recall, and use characters in a variety of written exercises. Feedback from the participants was also collected to gauge the perceived effectiveness of a given method, and items such as participants’ likes, dislikes, challenges faced and suggestions for future teaching. Caitríona is funded by SALIS. Wichaya holds a BA in English from Thammasat University and a Master’s Degree in Education from Chulalongkorn University, Thailand. Her PhD research project revolves around the subtitle production network of a subscription video-on-demand (SVOD) service provider in Thailand, aiming to examine different constituencies that form the network under study and their contribution to the productivity of the network. Wichaya is funded by Thammasat University, where she teaches English and translation in the Department of English and Linguistics, Faculty of Liberal Arts. Aparajita has a BA in French Language and Literature from Jawaharlal Nehru University (JNU), India. She has 3 MA degrees in 1) French Translation Studies from JNU, New Delhi, 2) Teaching English to Speakers of Other Languages (TESOL) from UCD, Dublin, and 3) French Comparative Literature (Master 2) from the University of Nice, France, securing a first class honours with distinction. She has written four research-based minor-theses at the postgraduate level. Two of them focused on Second Language (SL) education with emphasis on Computer-Assisted Language Learning (CALL) and listening comprehension skills, while the other two focused on two distinct genres of French narrative discourse. She succeeded in France’s highly competitive national level exam CAPES, to be a certified teacher. While teaching in France, she designed, secured funding and coordinated a 150,000€ ERASMUS project involving seven European countries (England, France, Germany, Italy, Poland, Spain and the Netherlands). She has ten years teaching experience as a foreign language teacher in the secondary and tertiary levels in France and Ireland respectively. She has mentored newly recruited teachers in France and continues to work on the same lines with online tutors from Lyon for her current research project. She is currently pursuing her PhD in the School of Applied Language and Intercultural Studies (SALIS) in Dublin City University. Her research interests are specifically in the domain of designed and emerging affordances in videoconferencing for language learning and more generally in the fields of CALL and online learning and teaching. She is a recipient of the Irish Research Council’s postgraduate scholarship award for her PhD research. Olivia holds a joint honours BA in Fine Art and History of Art (National College of Art and Design), a H. Dip in Psychology (Trinity College Dublin), and a first class honours MA in Digital Arts and Humanities on the topic of internet memetics (on scholarship from University College Cork). Her PhD research combines these academic areas to investigate the reception of onomatopoeia in Japanese comics and the implications of this on translation for digital simultaneous-publication (simulpub). Olivia is funded by the School of Applied Language and Intercultural Studies at Dublin City University. Alessandra Rossetti holds a BA in Language and Intercultural Communication from the University of Salento (Lecce, Italy) and an MA in Specialised Translation from the University of Bologna (Forlì, Italy). Her PhD research revolves around the usability of authoring strategies for the simplification and machine translation of health-related texts. The goal of her research is to facilitate the dissemination of healthcare information to native and non-native speakers of English. Alessandra is a member of the EU-funded project Interact (https://sites.google.com/view/crisistranslation/home) which deals with translation in health-related crises. Alessandra’s research is being funded by the Irish Research Council. Mali Satthachai holds a BA in English Language and Literature from Thammasat University, Thailand, and an MA in Translation Studies from the University of Birmingham, in the UK. She has worked as a professional translator at the British law firm, Herbert Smith Freehill, Bangkok and as a lecturer in translation at Chiang Mai University, Thailand, since 2012. She is currently pursuing a full-time doctoral programme at Dublin City University, Ireland, where she is using corpus tools to investigate patterns in legal translation between English and Thai. Eline holds a BA in Japanese Studies and an MA in Asian Studies from Leiden University, the Netherlands. She is currently pursuing a PhD degree in Applied Languages at Dublin City University in Ireland. For her doctoral research she employs eye-tracking technology to investigate online viewing behaviour of language learners of Japanese while watching a Japanese variety show with same-language text on screen. Her research interests are multimodality, Japanese language teaching, Second Language Acquisition (SLA) and Computer-Assisted Language Learning (CALL). Eline is funded by the School of Applied Language and Intercultural Studies at Dublin City University. Èrika graduated with a BA in Translation and Interpreting from the Autonomous University of Barcelona. She has experience as an English teacher in a number of private institutions, including Kanazawa Seiryo University (Japan). For two consecutive semesters, Èrika was also in charge of designing and delivering the module ‘Catalan Culture’ for MA students in the University of Girona (Catalonia). Her PhD research is concerned with Japanese pedagogy, and it aims to identify the pragmatic challenges students face when learning Japanese oral interaction. She currently teaches two Japanese modules in Dublin City University (DCU). This project also seeks to create and implement a course in DCU to enhance the teaching of pragmatics. 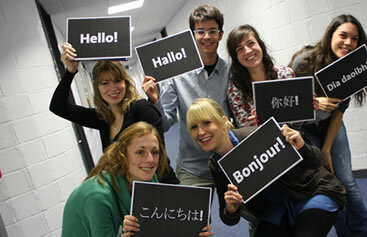 Èrika is funded by the School of Applied Language and Intercultural Studies (DCU). Yuxiang’s educational background is cross-disciplinary, with an undergraduate double degree –– BSc in Optical Information Technology / BA in Translation Studies, an MA in Computer-Aided Translation, and most recently an MPhil degree in which he focused on the lexical and syntactic issues regarding Machine Translation (MT) for academic texts. Prior to joining the CTTS, Yuxiang’s MPhil research was completed at the Chinese University of Hong Kong, involving corpus-based analyses of the critical aspects of using MT to translate optics research articles, and his current PhD project is in many ways an extension of his previous investigation. For this PhD project, he is interested in the correlation of the cognitive load in post-editing to source- and target-text features, particularly in respect of lexical and structural ambiguity. The project addresses MT post-editing in the context of optics writings, ultimately aiming at pushing MT to produce useful translations from non-perishable content, widening access to specialised content that is available in English only, and assisting non-Anglophone scientists who are challenged by the dominance of English in scientific communication. In addition to research, Yuxiang also teaches Economic Translation and Scientific Translation (Chinese-English) at DCU. He is funded by the School of Applied Language and Intercultural studies, Dublin City University. Dr. Magdalena Dombek  – A Study into the Motivations of Internet Users Contributing to Translation Crowdsourcing: the case of Polish Facebook user-translators. Dr. Martina O’Byrne  – Interpreting without a Safety Harness: The Purpose and Power of Participants in Interpreted Health and Safety Training for the Construction Industry in Ireland. Ms. Manuela Ascari  – M.A. by Research – A Discourse Analysis of Interactions from an Online Pro-Anorexia Forum. Dr. Giselle de Almeida  – Translating the Post-Editor: An Investigation of Post-Editing Changes and Correlations with Professional Experience Across Two Romance Languages. Dr. Michele Milan  – Found in Translation: Franco-Irish Translation Relationships in 19th Century Ireland. Dr. Joss Moorkens  – Measuring Consistency in Translation Memories: A Mixed-Methods Case Study. Dr. Stephen Doherty  – Investigating the effects of controlled language on the reading and comprehension of machine translated texts: A mixed-methods approach. Dr. Catherine Fowley  – Publishing the confidential: an ethnographic study of young Irish bloggers. Dr. Sylvie Thouësny  – Modeling second language learners’ interlanguage and its variability: a computer-based dynamic assessment approach to distinguishing between errors and mistakes. Dr. Midori Tatsumi  – Post-Editing Machine Translated Text in a Commercial Setting: Observation and Statistical Analysis. Dr. Yanli Sun  – An Investigation into Automatic Translation of Prepositions in IT Technical Documentation from English to Chinese. Dr. Nora Aranberri Monasterio  – -ing words in RBMT: multilingual evaluation and exploration of pre- and post-processing solutions. Dr. Colm Caffrey  – Relevant abuse? Investigating the effects of an abusive subtitling procedure on the perception of TV anime using eye tracker and questionnaire. Dr. Marian Flanagan  – Recycling texts: human evaluation of example-based machine translation subtitles for DVD. Dr. Johann Roturier  – Using Controlled Language to Improve Machine Translation. Dr. Mary-Ann Kenny  – Discussion, cooperation and collaboration: group learning in an online translation classroom. Dr. Marion Winters  – A corpus-based investigation of translators’ style in translations into German of F. Scott Fitzgerald’s The Beautiful and Damned. Dr. Gabriela Saldhana  – Style of translation – An exploration of stylistic patterns in the translations of Margaret Jull Costa and Peter Bush. Dr. Jody Byrne  – Textual Cognetics and the Role of Iconic Linkage in Software User Guides.